I get the picture. That dough was thrown around so effortlessly. Once it was dressed, the pizza was still being dragged about without really loosing its shape or breaking apart. 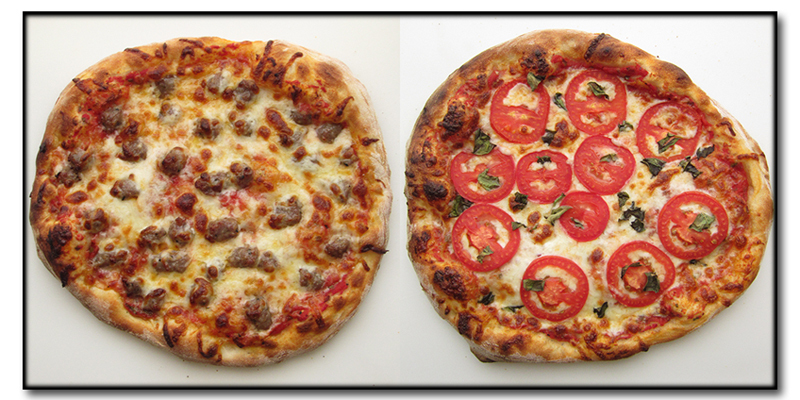 I've made a few pizzas recently using dough that rested a few days. All is well if I can shape the pizza on the first try. Mess it up and begin again, it is very, very unforgiving. I'm interested in the shaping technique, because my pizza's middle is very thin (maybe too thin) and the edges thicker than desired. mhill95149 wrote: I use the TJ dough all the time. Preheat oven to 450-500. Heat a cast-iron pan to blazing hot. Shape your dough. Throw your dough disk onto the cast iron pan. If your pan is evenly heated, you're not going to need to move it around. If you want to be safe, rotate it a half turn anywhere from 30-60 seconds into the cook. Pay very close attention to the dough. It cooks fast. When you're done, you should have a very nice bottom, with charred flecks (and flavor) just like from a wood-burning oven. The top will be mostly raw. 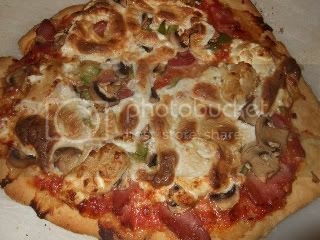 Top pizza and finish in the oven until top crust is browned. I usually do four crusts one after another on the pan, then finish all four at the same time in the oven. There are a lot of different cast iron methods, but this is the easiest, least-hassle one for me, and it produces the results I enjoy. It has some of the flavor of a blazing hot wood-burning oven, but it doesn't quite have the lightness. You can also try topping your pizza while it's on the pan, and finishing it in the oven, but I actually prefer the results of topping it after cast-ironing it, although I need to try another side-by-side comparison. I've also tried to finish under the broiler but, in my oven, the results were better in a preheated 450-500 degree oven. Under the broiler still left a bit of the dough undercooked. 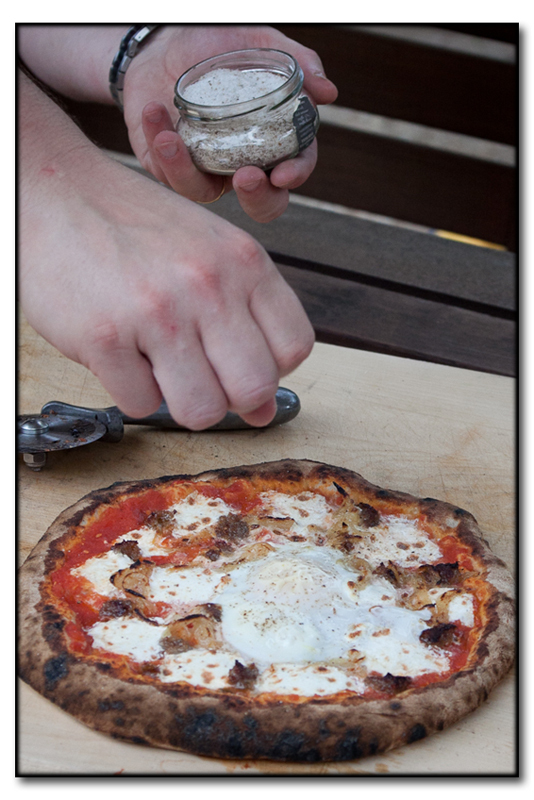 I far prefer this method to any results I've gotten with a pizza stone. Interesting. Thank you, Binko. I'll try that. I still can't get the thinness I desire with my dough, whether it's TJ's or homemade. 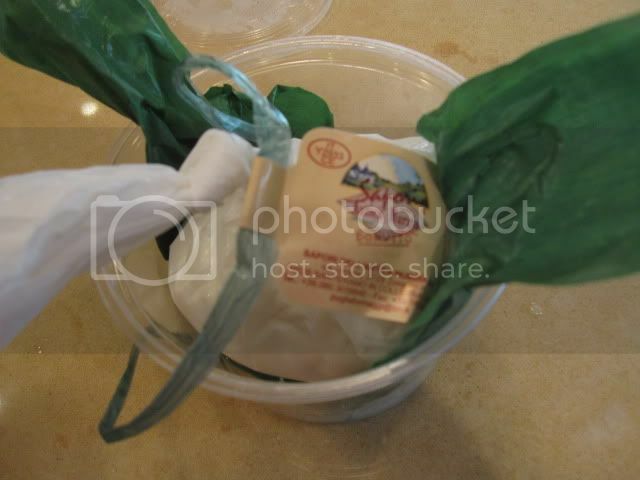 Here is how I get fairly thin homemade dough. Heat oven to 500 with pizza stone inside. Roll out a thin dough. Sprinkle a baking sheet with cornmeal. Put the pizza on the baking sheet. Place in the oven and immediately place the pizza stone upside down on top of the dough. Let bake for 2-3 minutes and then take out, top and bake direstly on the oven grate for 5 minutes. You should have a thin crispy crust. Katie wrote: Interesting. Thank you, Binko. I'll try that. I've had problems with th TJ dough springing back a lot on me, leading to a thicker product than I desire. I handle it the same way as my homemade doughs (at least I think I do) and I always find myself fighting it. That said, it has a pretty decent flavor. If you want to keep your dough thinner using my method, you might want to try topping the pizza before putting it on the cast iron. 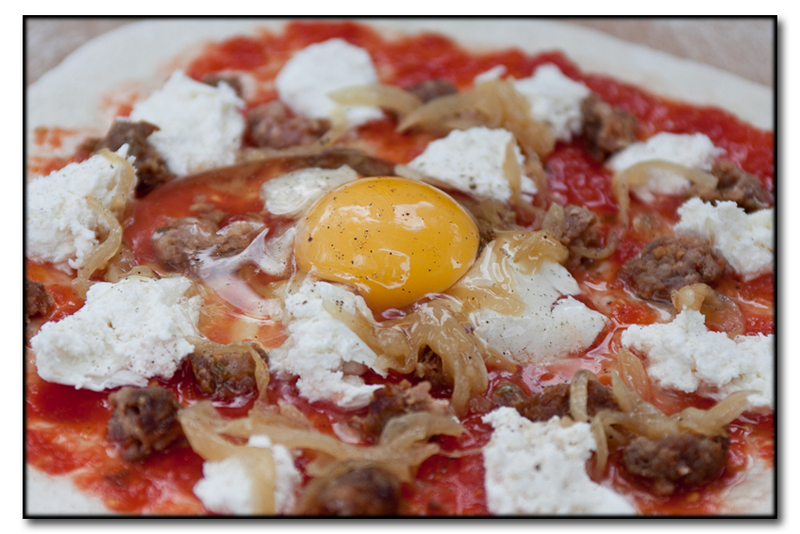 The lack of toppings causes the dough to rise in the center, so your final product ends up being much more puffy than a Neapolitan pizza. The last video Bill posted is pretty close to the look of the final product (although you don't get quite the extreme airiness because the dough isn't surrounded by 800+ on all sides when cooking on a pan.) 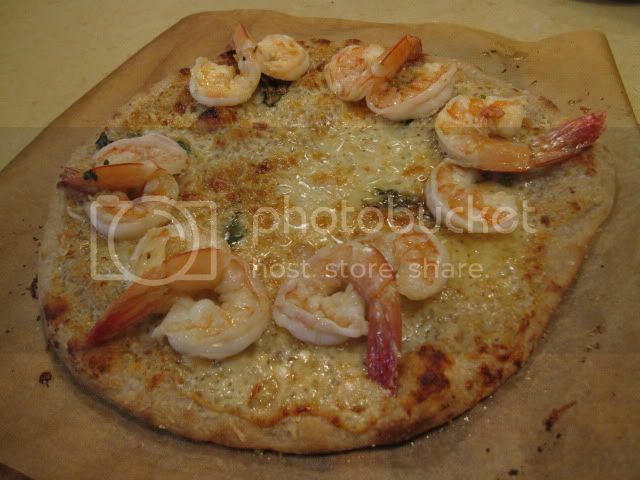 Next time I make pizza, I'll post pix. It was a little hard to cut (I think I should have added the arugula last), but tasty. No pics but I also made another asparagus, bechamel (this time with manchego and fontina), pistachio which was great. I really like the bechamel on pizza. Basically, you heat 1 T butter or oil, add 1 heaping T of flour, stir over low heat until the color just begins to change, then add 1 cup warmed milk (I use 1 or 2 % which works great), continue to heat and stir for about 15 minutes or until thickened, then add a little cheese and seasonings (salt, pepper, cayenne, nutmeg, etc). I feel like this gives a creaminess and helps keep the pizza from being to heavy with a lot of cheese. 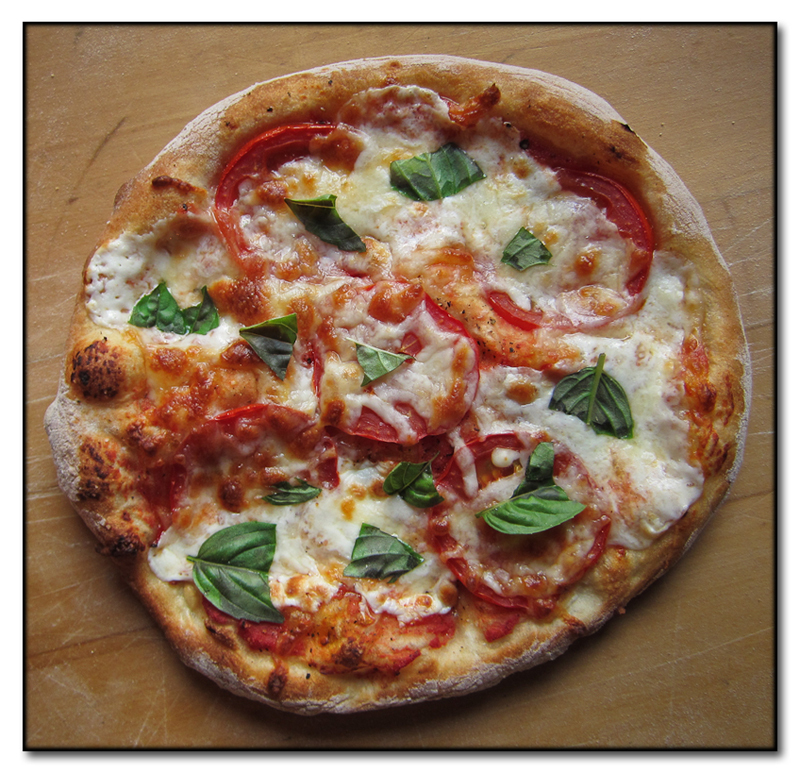 Also did another mozzarella, parm, cherry tomato and basil with basil/mint/lemon verbena(few leaves) pesto added after the pizza was cooked. Really liked the hint of lemon from the verbena. FWIW, once you add the cheese I think you technically have a mornay sauce rather than a bechamel. Semantics aside, it sounds like a very tasty pizza. 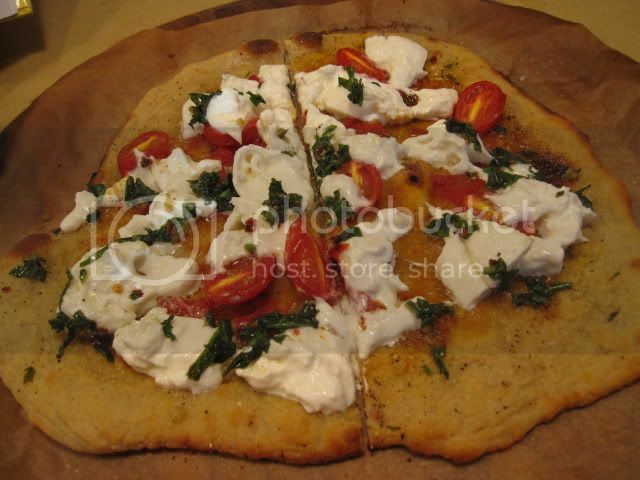 Looks great, I am making grilled pizza tomorrow and may try similar. Did you saute the mushrooms first? Really good pre-caramelization on some crimini's last time turned a mycophobiac into a fan. More people should try it. Got drenched cooking BBQ on Saturday so when it started pouring just when I was going to light the cooker for pizza tonight I called an audible and went oven. I've settled on a slightly wet dough for the high heat of the Big Green Egg which proved a bit moist for standard oven use. Problems compounded by the fact I used a sheet pan instead of my pizza stone resulting in bland crust without toastiness. Still quite edible, no Chinese takeout necessary, but not the big flavor pop of high heat lump charcoal/wood using an outdoor cooker. hey! You generated a pull quote for the main page! G Wiv wrote: Still quite edible, no Chinese takeout necessary, but not the big flavor pop of high heat lump charcoal/wood using an outdoor cooker. No such problems tonight. 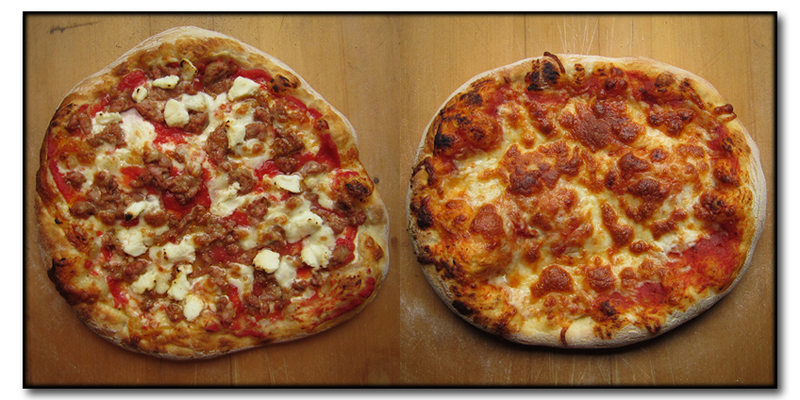 Pair of pizzas on the Big Green Egg at just over 600 degrees. Wow! Gary that looks awesome, nice cross utilization of the Big Green Egg! 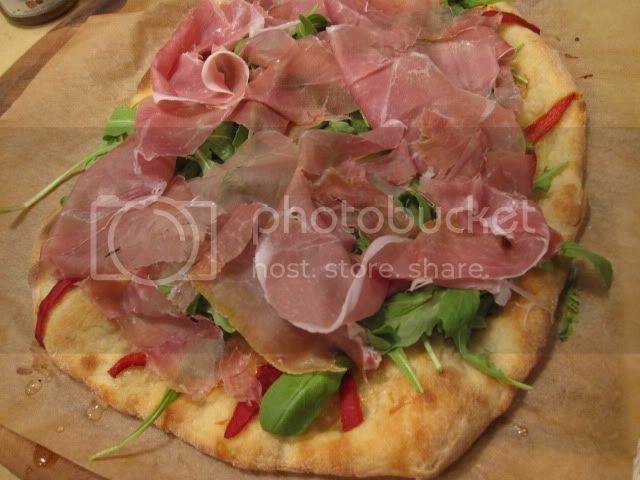 mhill, that's the best-looking pizza I've seen in a long time. I might be inspired to try this when we get the good stuff (corn-wise)! Any dairy on that pie? 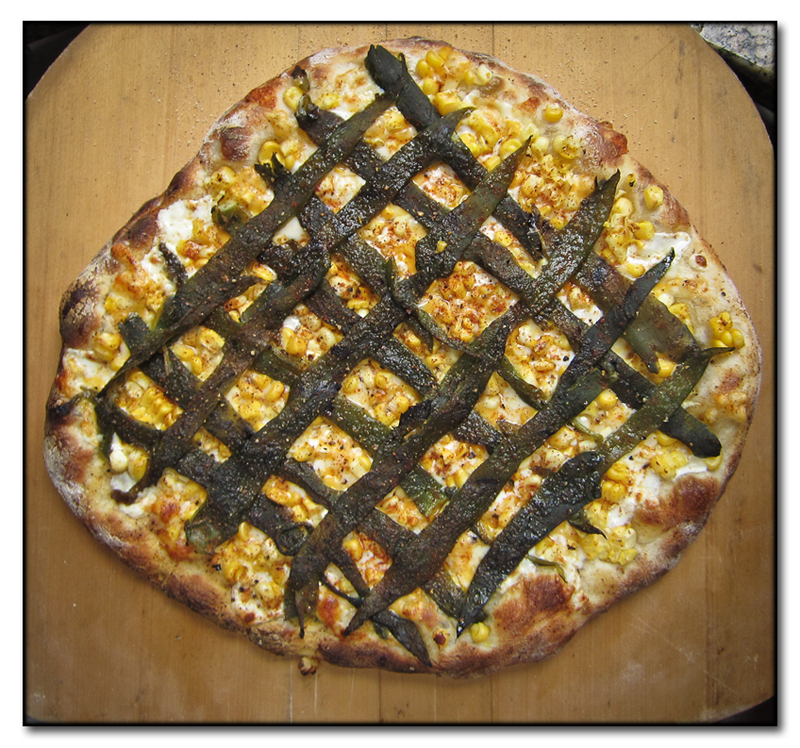 gastro gnome wrote: mhill, that's the best-looking pizza I've seen in a long time. I might be inspired to try this when we get the good stuff (corn-wise)! Monterey jack cheese & a bit of leftover fresh mozz. below the corn and peppers but a FB friend suggested queso fresco and I'm going to try that next time. mhill95149 wrote: Monterey jack cheese & a bit of leftover fresh mozz. below the corn and peppers but a FB friend suggested queso fresco and I'm going to try that next time. I don't think queso fresco will melt, so you could use it more as a topping than underneath. But I like where you're going. A cilantro garnish wouldn't be out of the realm either. We added a bit of cilantro (post photo) and I'm sure you are right about the cheese. I've never worked with the Mexican? cheeses other than Queso Chihuahua. 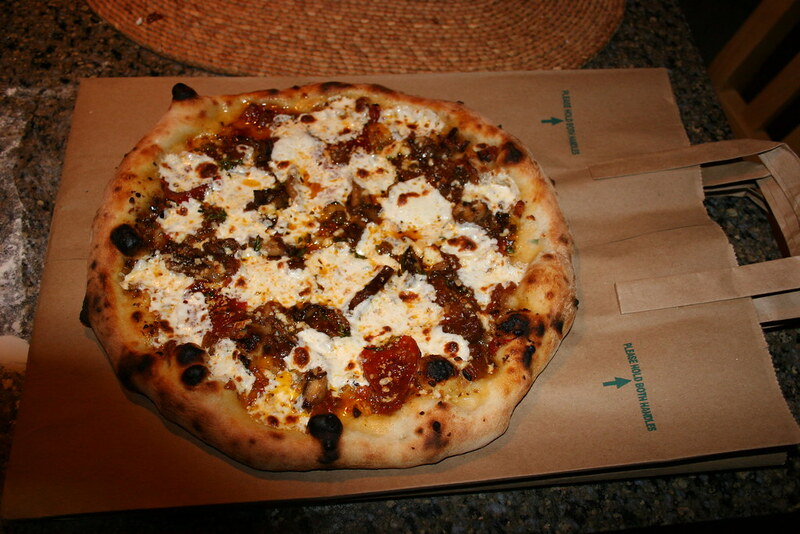 gastro gnome wrote: I don't think queso fresco will melt, so you could use it more as a topping than underneath. Queso fresco melts fine. I crumble it and mix it with grated mozzarella and anything else that seems ready to break out of the cheese drawer. 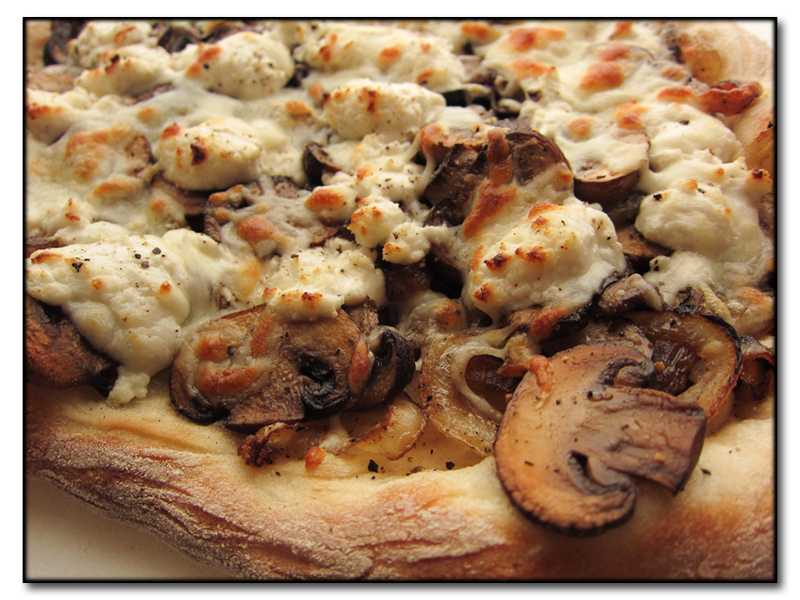 Pizza made with mushrooms, caramelized onions and fresh mozzarella from the farmers market. The sauce was just some store bought olive tapenade thinned with some olive oil. Also threw on a few pepperoni that were left over in the fridge. off the Weber kettle, 1st pizza's on the grill ever for me. Did 3 cooked on a foil wrapped paver with coconut charcoal and hickory. Pizzas got better as my technique improved and the grill got hotter. nice learning experience. Basic homemade dough and sauce. I could see doing pizza on the grill again. Last edited by jimswside on July 12th, 2010, 7:10 am, edited 1 time in total. 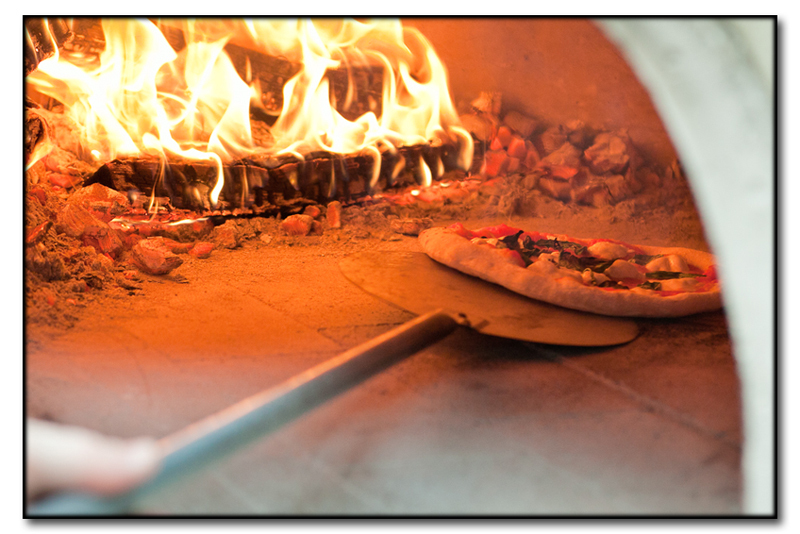 Went to LTH member Craig B's house for some of his wood-fired pizza tonight. A little truffle salt? Sure, why not?